The national leader of the All Progressives Congress (APC), Bola Tinubu, has reacted to the defection of Senate President Bukola Saraki and Governor Aminu Tambuwal of Sokoto State from the party to the Peoples Democratic Party (PDP). 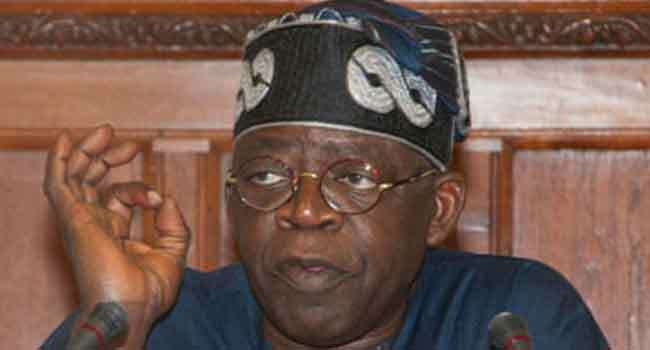 In a statement entitled “They Go Away Because We Go the Right Way” and personally signed by him on Sunday, Tinubu said the Senate President and the Governor left the ruling party because the APC refused to give them automatic tickets for the 2019 elections. The defections of some people from the APC have generated sensational headlines and exaggerated talk as to what their departures foretell for the APC, the party to which I belong. Some have predicted the demise of the APC. Those who hope for our decline will be disappointed by the inaccuracy of their desires. The days, months and years ahead will bury such errant forecasts for these predictions are born more of bitterness than of objective analysis. Much of the attention has centred on which party now controls this or that state and which party maintains a majority in the National Assembly. These considerations are important to members of the political class and the electoral calculations of the political parties. But these calculations cannot be all there is. We must be careful not to reduce our horizon to a mere accounting of elected officials moving from one party to another. Many in the political class believe this score keeping between the parties encompasses all that is important. For such people, the mere holding of office is the sole objective. The quality of governance they provide means little to them. Yet, there are greater things at stake than the fortunes of individual politicians. The people of Nigeria focus their attention on something materially different than this narrow political game. The people are more deeply concerned with the quality of governance they experience than with the intense cunning by which the political game is played. They are more interested in helpful policies than in the tempests created by politicians in pursuit of personal ambitions. That which provides a better life in a more prosperous nation is what beckons to them. That which shines in the eye of the political opportunist is dross to the average person. We must pull back from the shallow headlines to recognise that something fundamental is at stake. Nigeria is undergoing a historic transition. Sometimes awkwardly, tentatively, yet inexorably, we nurture political and governance reform. We steadily close the door on the old malpractices that have caused a rich nation to reside in the tenement of the global poor. The corruption of the past is ending; for it must end if we are to fulfil our collective purpose. With this correction, less public money will be diverted to private benefit. More will be afforded to the causes of the people. The economy is being transformed so that the average person will have a better chance of finding a better life. “We move toward a more democratic union. The old days where a handful of uninformed men and those with deep pockets decided everything for everybody are being swept away. The will of the people can no longer be ignored. Those who would be the masters over the people must now be public servants. A party or elected official may no longer rule over the people. They must govern for the benefit of the people. By so doing, the arc of our national progress is shaped. Not everyone is happy with this trajectory. As a whole, the political class must relinquish some of its power and wealth so people can enjoy a more equitable portion of the national enterprise. This is the correct and perhaps inevitable course Nigeria must pursue. To their credit, many politicians see the need for reform and even champion it. Yet, there are those in the political class who scheme against collective improvement. They seek to halt progress toward a fairer nation. They seek to hold to the old ways. The difference between the two parties and why some people returned to their PDP conclave must be seen in this light. This is more than competition over numbers. What rests in the balance is not whether one party has more elected officials on its roster, but which party has the right mindset and policies to reform Nigeria that she may become what goodness demands of her. We are in locked battle to define the future of this nation and the quality of its governance. This battle pits one party, the APC, with all of its imperfections, that seeks national reforms against another party, the PDP, which symbolises the perfection of the most selfish designs of the most selfish politicians among us. This moral battle informed the recent defections. Those who belong to that PDP mode of thought could find no permanent comfort in walking the path of progressive reform and progress. All the things we have inaugurated such as school-feeding programs for poor pupils, social security for poor families, affordable housing programs, greater access to credit for small businesses and greater access to education and health care, these things the defectors could not well abide. They detested President Buhari’s Treasury Single Account (TSA) innovation because it barred them from misdirecting funds into a maze of unaudited accounts from which they could siphon as they pleased. Buhari cut off their clandestine illicit spigot. Even more so, they detested the APC drive toward greater internal democracy. They bristled when we demanded that congresses and conventions be held; they had demanded giving themselves automatic extension in their positions. They privately erupted as the APC decided that direct primaries where all party members vote on the party’s nominations should be the way of the future. The injection of greater democracy meant a decrease in their ability to manipulate end results. Politics will be ushered out of the backroom and given to the people to whom sovereignty genuinely belongs. These men could not countenance such transformation. They saw it not as the gift of democracy but as an obstacle that complicated their self-interest. They left the party to return to a motley agglomeration that would promise them what true democracy could not: automatic tickets, sharing of the national wealth and other offices and privileges. “Their defection statements swell with high-sounding words and the attempted grasp of lofty ideals. While I shall refrain from being so coarse as to call these statements counterfeit, I must invoke a sufficient level of common sense for the protection of all. Anyone who accepts their statements at face value will quickly experience buyer’s remorse. Their attempt at fine notions aside, what compelled these people was galloping yet blind ambition. Governor Tambuwal’s exit can be distilled to one cause. He covets the presidency. However, he had not the stomach to challenge President Buhari in a primary. Tambuwal felt further insulted that he would be compelled to face a direct primary just to retain the governorship nomination. But for the promise made by PDP headliners like Rivers State Governor Wike that he would have the PDP presidential nomination, Tambuwal would not have left. His exit had nothing to do with governance of the nation. It was about forging a personal ambition predicated on the defeat of progressive reform not the advancement of it. “Much the same for Senate President Saraki. 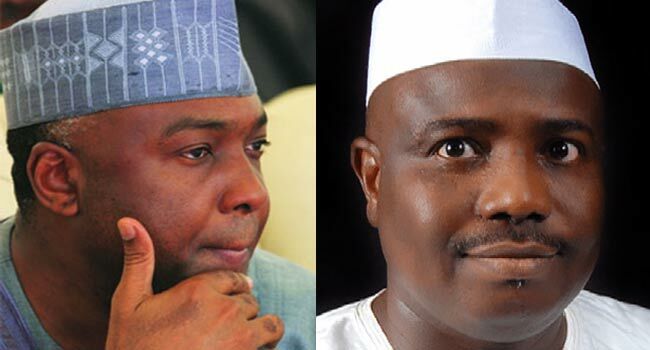 Returning to the PDP, he harbours dreams of the presidency but Tambuwal’s ambition will dwarf Saraki’s when the two collide. If Saraki had remained in the APC, he would be unable to reclaim his Senate seat let alone the Senate Presidency. He thus bolted because he lusts for the presidency but was promised by the PDP, at least, a return to his position in the Senate. For Saraki to talk about lack of governance is for him to deny who he is and the position he holds. This man stands as Nigeria’s Number 3 citizen. Clothed is he in ample power and influence. If he saw areas where government and the nation needed help, he could have easily applied his energies to these areas. He could have drafted legislation and easily got laws passed. However, no progressive enactment bears his name for he cared not for progress. He has been more focused on changing the rules of the Senate to favour himself and changing the order of elections so as to coincide with his selfish designs. The rest of the defectors were given similar assurances by the PDP as to their offices. The APC refused to make such bargains as they are part of the ancient regime; these bargains are not of our democratic new way. There is nothing wrong with ambition. Without a degree of ambition, we would never strive to improve and develop ourselves. But ambition, restrained by nothing but itself, is a dangerous commodity. Unwedded to social conscience, it leads to ruthlessness; it is the father of the deception that leaders are meant to lord over instead of to serve the populace. In the final analysis, the reason for the defections is as clear to see as it is crooked in its motives. The APC seeks to reform governance and politics. However, many powerful people believe the established system assures their maximum benefit. Progressive reform would defeat them. They must fight reform and never be allied to it. Thus, they had to leave the APC. In a fundamental way, the APC may be better for their exit. It would be untrue to say their departures did not generate concern. As the air clears and we can better assess what is lost and gained by their exit, I can truthfully say the APC will be better off because they are gone. We can now focus more wholly on democratic governance inside and outside the party. Inside the party, we have adopted direct primaries to discourage corruption of the democratic process. Regarding public policy, we can now better articulate our progressive stance without having naysayers among complaining that we are going too far or that the good we seek for the people ought not to be done. We can more decisively push for the jobs program, expansion of social security for the poor, affordable housing programs and a viable mortgage system, national infrastructural program that will provide adequate power and potable water, basic health care for all, and educational reform. Each of these is important in itself. In combination, these objectives shall reshape the very landscape of our political economy. They shall bring fairness and prosperity where none has been. They will give the average person a government that serves them and the land that they deserve. But this prospect means a large segment of the political class will oppose the APC. We, as a party, must have the courage to accept this reality. Having decided to place the public welfare above the private welfare of the few, we must forge ahead no matter the foes aligned against us. This struggle toward a better Nigeria is hard, described more by difficult obstacles than by smooth passages. Had reform been easy, the task would have already been accomplished. Powerful hands have gathered to halt our collective move forward. Not everyone wants a better Nigeria for all. Those who profit from the imbalances of the past are those who fear a fairer tomorrow. Come the general election, the people will face a stark choice. If they want to relive the certain failure and inequality of the system the PDP had erected against their very interests, the people will walk the way of the defectors. If the people want to give themselves a better chance at an excellent nation they will adhere to the path elected in 2015 when they voted for reform and the APC. I believe in the collective wisdom of the people. They will choose the right way for they are Nigerians which means they shall do what is right and just.